Situated in a recently renovated country home this in-frame kitchen project brief was to create a space that feels homely and suitable for a busy family, whilst maintaining an impactful design. The building contained many of its original features and so it was important for the kitchen to remain traditional in design, with contemporary style and features offering a unique twist. In-frame kitchens are very much on-trend these days, offering an extremely durable and aesthetically pleasing solution to custom-designing the most important room in your home. With this in mind, we thought now would be the perfect time to expand a new range of products and give our Baystone Shaker In-frame a brand-new look. 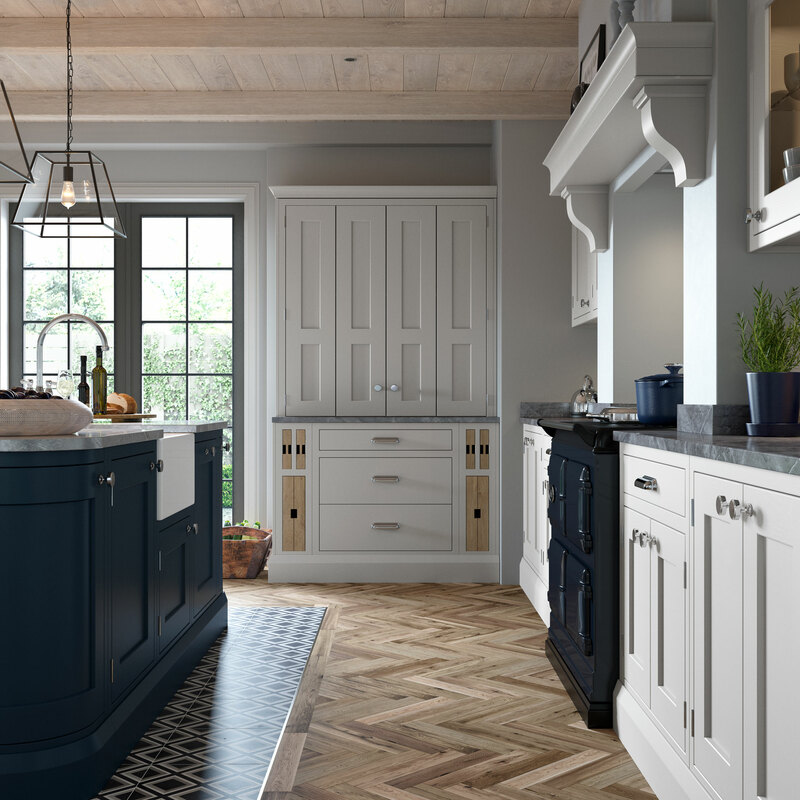 New for 2019, we have designed two distinctively different In-frame kitchens, a classic and the contemporary, demonstrating the flexibility that the range provides. Here we will showcase the Classic. Situated in a recently renovated country home. The building contained many of its original features and so it was important for the kitchen to remain traditional in design, with contemporary style and features offering a unique twist. The extended brief was to create a space that feels homely and suitable for a busy family, whilst maintaining an impactful design. An open plan living space seemed the natural choice, as this allows for the space to be enjoyed by all the family at the same time – around their own little island! 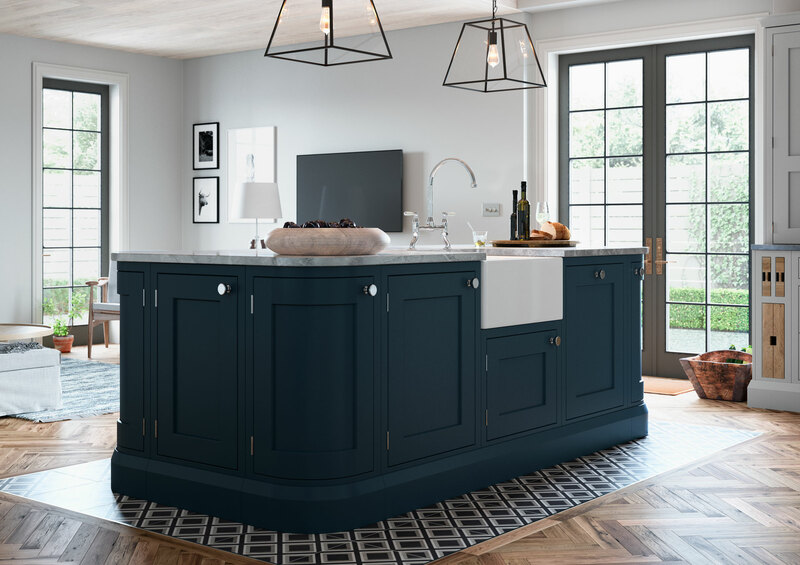 The island painted in our bespoke colour Dark Blue provides ample worktop space for food preparation and is perfect for laying out nibbles for the kids to enjoy whilst watching TV. 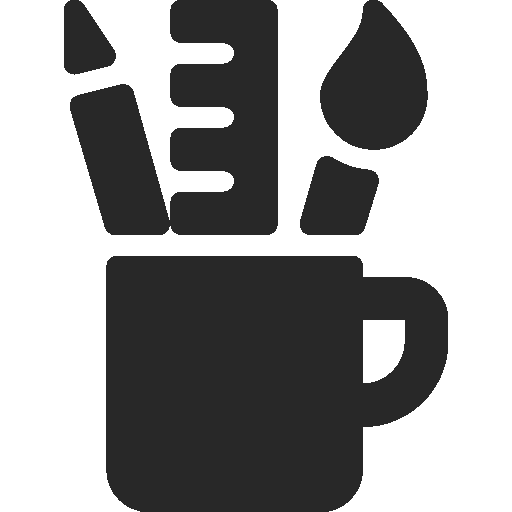 For extra style points, statement geometric tiles (Black and Ivory – British Ceramic Tile) were added underneath. This helped to create separate zones in the kitchen areas and drew the eye to the island. The remainder of the kitchen was finished in Light Grey, which ensured the room stayed open and fresh, working well as the perfect backdrop to the blue. A traditional pantry is something every self-respecting kitchen owner wants in their life! 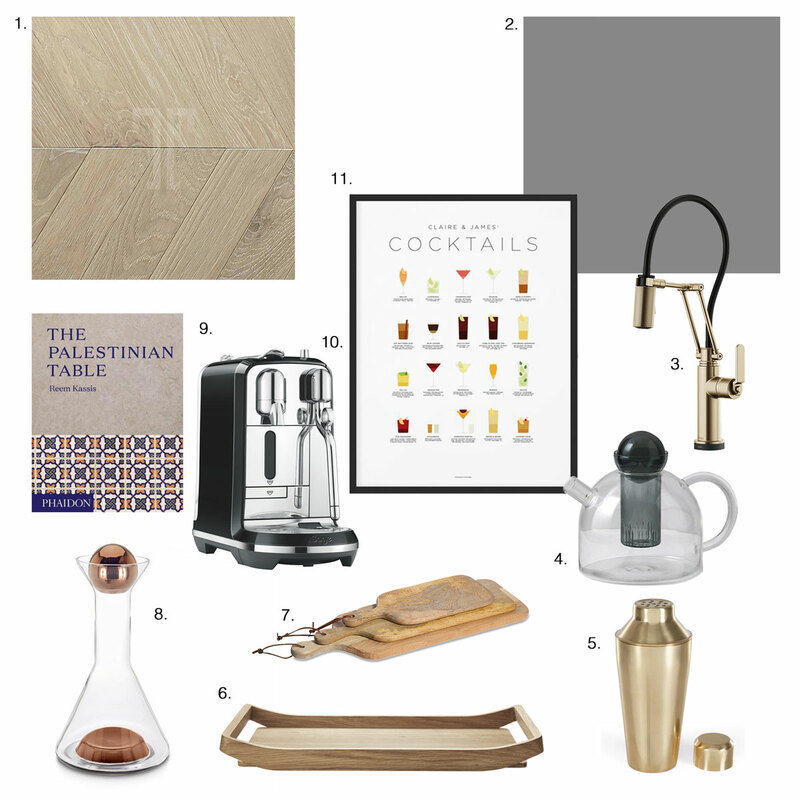 Here, the pantry unit is featured with a stylish chopping board and dinner tray set that neatly tucks away. 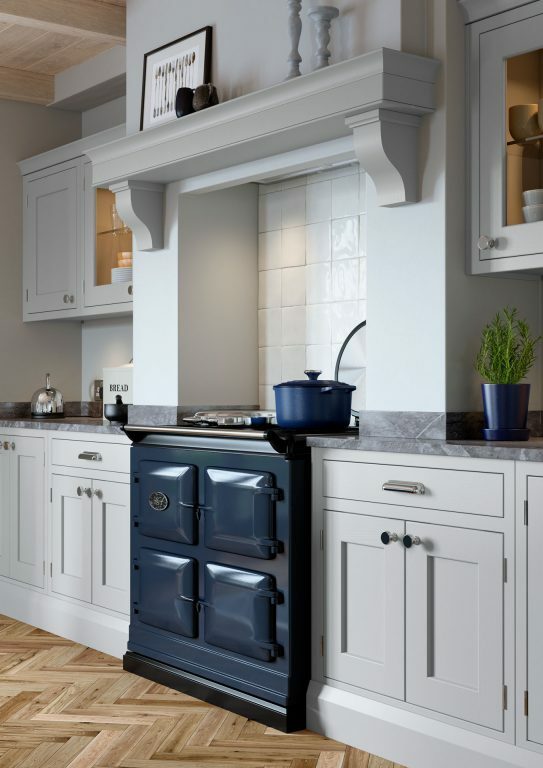 We also chose a contemporary over mantle with corbels, to sit above a classic Aga in slate with Country Rustic White Field tiles from Topps Tiles as a backsplash. The selected worktop is a mixture of Dekton Kira (on the island) and Dekton Vera (on the remainder of the kitchen), which perfectly complements the tones found in the kitchen. 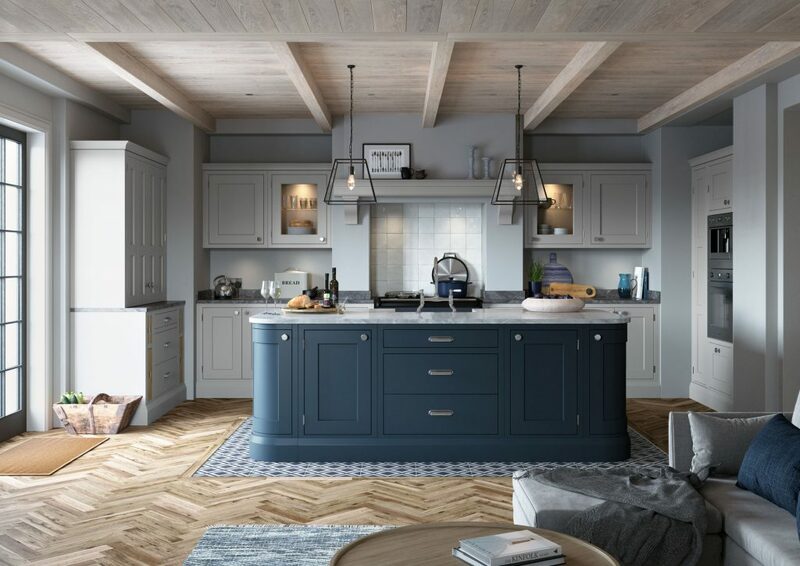 Herringbone flooring (Tumbled Block Rustic Solid Oak – Havwoods) provides a solid foundation for the kitchen and can help to make any room feel classy and luxurious. To finish off the space perfectly, polished nickel hardware was chosen for its bright and classy look. Whatever your preferred style of home décor, the Baystone range has something that will meet – and exceed – your expectations. We ensure our products are made from the finest materials in Europe, crafted to the highest standards and finished by skilled painters to ensure the 'First Impression’ is the right one.